Looking for lovies at baggage claim, but mind their little fingers. Mom and her two precious cargoes wait for plane. 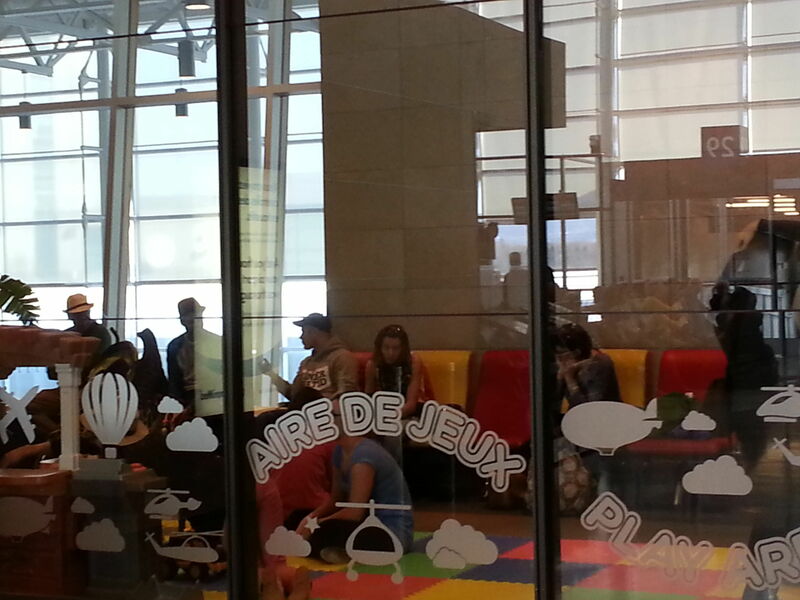 Take advantage of kids' lounges at airports when you find them; this is Air Canada in Quebec. Protect your baby’s health in-flight, as well as the sanity of other passengers (and your own! 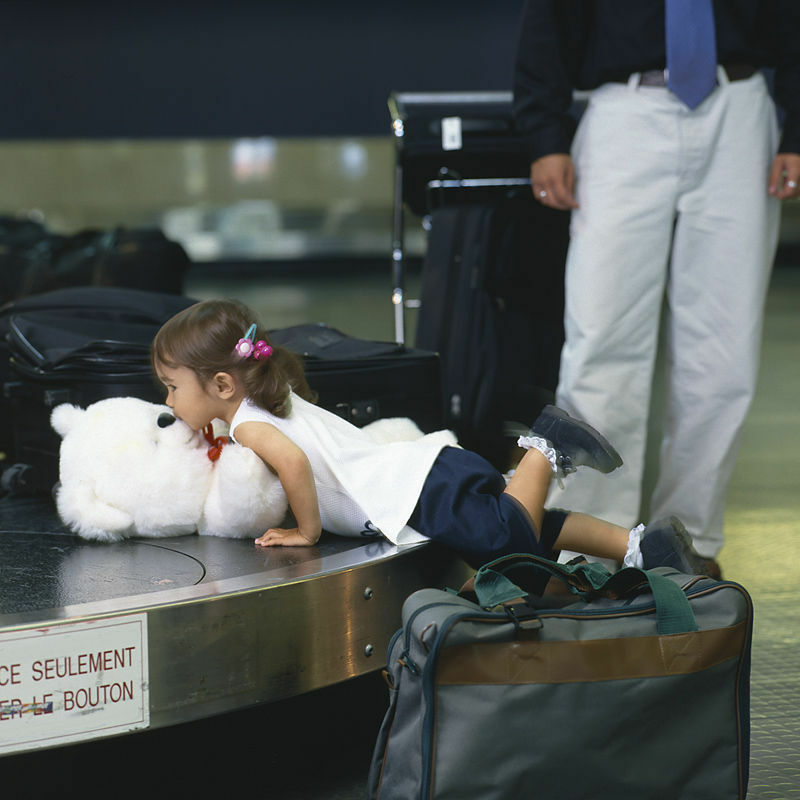 ), with these helpful air travel with baby tips — good for the holidays and all year round. With airlines flying at almost full capacity, long lines at the security checkpoints, and airports suffering from mid-air gridlock, many new parents dread the day when they’ll have to board a plane with their new bundle of joy. Don’t. Getting there is not so bad, if you know what you’re getting into. The following FAQs, plus a dash of good humor, should help make that first plane flight with baby one to remember — and even cherish! 1. How Young Can A Baby Fly? At FTF, our most frequently asked question is, “Is my baby too young to travel safely by airplane?” Popular opinion to the contrary, medical experts have found no reason to restrict travel by healthy newborns, as long as a pediatrician who has examined the infant approves the trip. Some airlines accept infants under a week old, however, at least seven days is recommended. And since many young families live far away from beloved grandparents and other relatives, plane travel with infants is becoming more common. However, you may want to limit trips that are for long hours aboard an airplane when traveling with newborns as they need frequent feedings and changing and tight places may be inconvenient. Use your instincts, you’ll know what’s best. 2. Which Airline Should We Fly? When it comes to travel, advance planning always saves you money and anxiety. Inform a travel professional of all children flying and their ages, and let the agent get you the best fares and seats. On most airlines, one “lap child” under 2 years can still travel free domestically in the United States with each fare-paying adult, without a guaranteed seat. Products such as the Baby B’Air vest, which enables parents to harness an infant to an adult seat belt, have minimized the safety issues for lap children. But to encourage the safest option — -restraint in an FAA-approved child seat (CRS) tightly buckled into an airline seat — -many major US airlines charge only 50% of the lowest ticketed adult fare for children under 2. Ask your travel professional to look into the foreign carriers’ fees; many savvy families choose “international” beach vacations just to save on children’s airfares! If you’re nervous about booking a foreign or low-cost airline, check with the FAA for airline safety records. Note that mileage award tickets are not discounted for children, so you may be better off paying cash for infant seats. 3. What’s the Best Flight to Take with Baby? Request flight times that take advantage of baby’s schedule: a flight spanning naptime is ideal. If you’re crossing several time zones, overnight flights will help a sound sleeper acclimate to the time change. If several airlines suit your schedule needs and your budget, demand service. Which one will guarantee seat assignments? Does every aircraft have changing tables in the toilets? How much legroom is available in coach? British Airways, who extend themselves for families, is one of the best. Many airlines including Air Canada, El Al, Emirates and Virgin Atlantic also welcome families with children’s amenities, baby food on board and kid-friendly entertainment. Be sure to request children’s meals at least 3 days in advance to your flight. 4. What’s the Best Seat For Baby and Me? If you’re traveling with a child over about 6 months or 24″ long, buy economy seats, but not the bulkhead row. Bulkhead armrests are fixed, which prevents the baby from straddling seats (if adjoining ones are vacant) to sleep. Also, many recently built planes have made bulkheads into Emergency Exit rows, now restricted to passengers over 15-years of age for safety reasons. Ask which rows have seat belt airbags — tiny airbags built into lap straps also may make plane seatbelts much safer for young or lightweight kids in flight. Tips & Strategies: Bring a car seat (CRS) on board whether or not you’ve purchased an infant seat. Children up to 20 lbs. should fly in a rear-facing CRS and children 20-40lbs. in weight should face forwards. For the safety of other passengers, a CRS should be tightly strapped into a window seat. Although the FAA states a CRS should be no wider than 16″ and labeled “certified for use in aircraft,” permission to use it must come from the airline itself. Be sure you or your travel agent have inquired about CRS regulations before booking seats. Call the FAA at 866/TELL-FAA for the latest in safety news. 5. What’s The Best Airport Strategy? Allow at least two hours in advance of departure to conquer the airport. Minimize hand luggage and use a front carrier, backpack or stroller for your baby to free adult hands for plane tickets, passports, and other papers. After you check your luggage at the curb or inside, carry your pre-printed boarding passes with you to confirm seating, then go immediately to Security so you won’t be stressed by the wait. Remember, security will insist that your infant be carried through checkpoints by an adult. If you’re using a stroller, keep it handy. Most airlines will ‘gate-check’ it on the jetway if you ask nicely. If you plan on carrying aboard liquids for your baby, it is important that you inform a TSA agent before passing through airport security that you will be boarding the plane with baby formula, breast milk or juice in quantities greater than 3 oz. They may ask you to drink some of it yourself to “prove” it’s safe. Planes are boarding earlier and earlier to maintain strict on-time records. If your airline still has a “women with small children first” policy, don’t rush onboard and be stuck for a 45-minute loading period. Instead, ask your partner to board first, allowing you and baby to pace the departure gate area until the last minute. 6. How Do I Cope Onboard? Keep carry-ons easily accessible under the seat in front of you. Since airline food has disappeared, bring some beverages and snacks or your own. To avoid dehydration, says noted pediatrician Dr. Barry Sears, children should drink plenty of fluids. Conversely, we’ve heard that you shouldn’t overfeed baby mid-air because their bloated tummies may cause pain and crying. Bring refillable bottles or “tippy” cups and open them carefully, as the change in air pressure may cause them to spurt. Nursing parents can carry a freezer pack with a few extra bottles which the Flight Attendant will warm in a microwave for you. With few vacant seats at the back, you’ll have to use the dreaded lavatory to change diapers. The toilet seat lid may be an easier, less wobbly place to change tiny ones than a wall-mounted changing table. Good luck! Keep at least one change of clothes handy for each adult and child, in case of emergency. Tip: International flyers should try to book an A-380 plane as this new Airbus model has amazingly spacious and baby-friendly toilets! 7. How Can I Prevent Ear Pain? “To prevent aerotitis media (ear pain) caused by a change of air pressure in the eustachian tube,” says Dr. Neal M. Kotin, “encourage swallowing during ascent and, more importantly, during descent.” Nursing, sipping and chewing all work for toddlers better than holding their nose and blowing out. Avoid the ‘Stewardess Cure’ — holding a cup filled with steam over each ear — as this technique can force moisture into the ear canal which may become infected. Many parents swear by Ear Planes, a small ear plug designed to equalize pressure changes in the inner ear. Dr. Sears recommends keeping infants comfortable by administering a saline nasal spray every hour to prevent a dry, itchy nose. Only wake sleeping children on descent if they have a history of ear pain. 8. How Can I Get the Baby To Sleep? How do you achieve the impossible, you ask? Those precious moments when your child is asleep are the only times you’ll be able to read, relax or stroll the aisles like the Good Old Days. 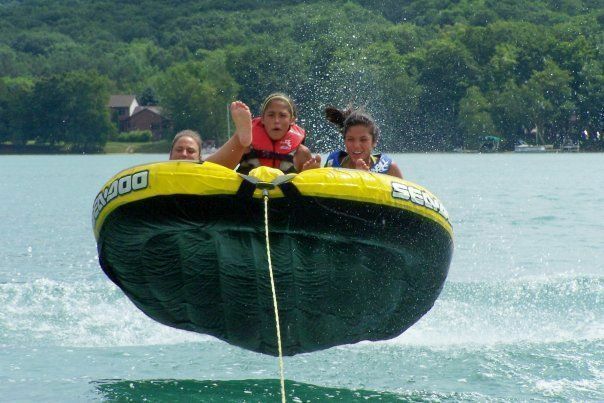 That is, if your arms aren’t pinned down by tiny legs, your thighs aren’t numb from having 20 lbs. lying across your lap, and your clothes aren’t soaked from perspiration or food spills. Welcome to parenthood up in the air! Need travel insurance for your family in case your little one gets sick? Protect your familiy, and your vacation, with travel insurance. Thanks for the feedback, that travel stroller you got looks like a great solution with 2 kids, but it’s pricey! Let us know how you like using it on your trip.